Expat Stories: I Fell in Love With the Country and the Culture. Tarija Just Felt Like Home. 1. How did you first hear about Bolivia and/or become interested in Bolivia as a possible place to live? My passion is high altitude backpacking. So, eventually, I ended up in this part of the world. From my first visit, I fell in love with the country and the culture. It just felt like home. 2. Where are you from originally and why are/were you considering living overseas when you first took Bolivia into account as an option? Navy brat and corporate transient... Bolivia came first, living overseas came second. 3. Which languages do you speak? If you do not speak Spanish, has this made adjusting to, and living in Bolivia more difficult for you? 5 months of Spanish classes and home study allowed me to communicate on a basic level when I arrived. I took some private lessons after I arrived but quickly discovered that what I needed was practice. Lack of language proficiency has made some things more difficult (process). It has also in a strange way facilitated my integration … the requirement to put yourself out there to practice plus the kindness and generosity of Tarijeños has been a winning combination. Poco a poco! (Little by little). 4. Did you come here as an individual, couple or family? 5. Are you planning to live in Bolivia short-term or long term? 6. 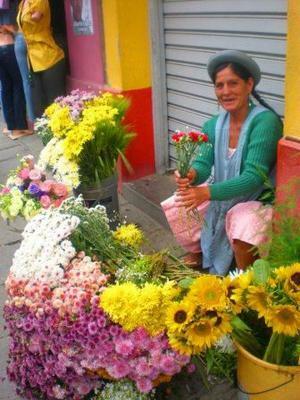 Do you work or plan to work or start your own business in Bolivia? I am a retired attorney... I will look for some volunteer opportunities at some point but have no present plans to “work”. 7. Is Bolivia the only country to which you contemplated moving, or did you consider other choices? If so, why did you ultimately choose Bolivia? It was always Bolivia for me... Bolivia chose me. 8. What steps did you take to research about Bolivia to prepare yourself prior to arriving? I did a lot of research on the country and specific cities. I returned 2 years ago for a month with the specific purpose of spending some time in Tarija, Sucre, Cochabamba, and Santa Cruz to evaluate infrastructure, real estate, overall feeling. 9. What do you miss most about your home country? The convenience of everything... integrated databases, big-box stores, the ability to do most everything “online”. 10. What do you like/love/appreciate most about Bolivia? The kindness and generosity of the people and the relative simplicity of the culture. 11. Did you relocate on your own, or do you work for a company that relocated you to Boliv-ia? I relocated on my own. 12. If your plan is/was to retire in Bolivia permanently, how did you prepare financially, and in other ways to make that possible? Nothing over and above... big difference here is that you can actually live on the Social Security piece of your planning. 13. For those of you who have lived in Bolivia for at least 6 months, now that you are here, what have you learned about Bolivia that you did not know before? Just how fragmented and fluid the process is for almost everything; how dependent processes are on paper; and how little information is shared between participants in the same process. How many of my thumb prints does any government need? 14. Is there anything about Bolivia that turned out to be very unexpected to you? The blogs are full of stories of incompetence and corruption involving the customs and visa processes. That has not been my experience. 15. What special skills or attitudes do you think a person or family needs in order to ensure their stay in Bolivia is enjoyable/successful? I think front-end planning and research is critical. Come with the right expectations and the odds are they will be exceeded. And, a willingness and ability to integrate the old and new cultures... come to create a new life, don’t keep looking back at the old. 16. Is there any reason you would NOT recommend Bolivia as a place to live, work or retire? 17. What is the most negative aspect about living in Bolivia in your opinion? Process... but I addressed that in question #13. 18. What are some of the most positive aspects about living in Bolivia in your opinion? And, for me, culture. The emphasis on family, the kindness and generosity of people, a focus on the simpler things in life. 19. Have you faced any unexpected difficulties while living here? Were you able to overcome those obstacles? Are they serious enough to cause you to want to leave? 20. If your children moved overseas with you, how did you prepare them for the differences in lifestyle or culture shock? Resist the urge to “cheap” on shipping your furniture and domestic items. Hire an international company and let them do the driving. Do it door-to-door. I cleared customs in 10 weeks from arrival in Arica to delivery in Tarija. What few issues were encountered were the responsibility of my shipper and his destination agent to resolve and expedite. Get some help obtaining your residency visa and finding a place to live. You’ll have enough to deal with emotionally... remember, you left family, friends, and the familiar behind. Take time to adjust and explore. If you like good quality bed linens and towels bring them with you! 22. What are some of the things that were most difficult for you to accept or adjust to in Bolivia? Process... again. And the relative inconvenience of daily living. It makes me laugh when I can buy a power drill and drill bits in one store but need to hit another to get the heavy-duty extension cord required. Ok, so I really miss Home Depot! 23. Prior to moving here, what aspects of living in Bolivia would you have liked to know more about or have more assistance with? Is there anything anyone could have done, or informed you about that would have made your choice to move to Bolivia, the relocation process itself, or your initial adjustment period easier, less stressful, less frightening? Expat forums are a blessing and a curse. There can be as much misinformation as information and the emotional content tends to be high. I connected with my in-country resource a year out from my actual move to help me sort fact from fiction and to respond to changing conditions on the ground. 24. Hindsight is 20/20. If you could go back in time to the months before you moved to Bolivia, is there were anything you would do differently to prepare for living in Bolivia? 25. Just for statistical purposes, had you heard of BoliviaBella.com or Expat Services prior to moving to Bolivia? If so, which parts of our website were most helpful to you? What information would you like to see added for future potential expats?